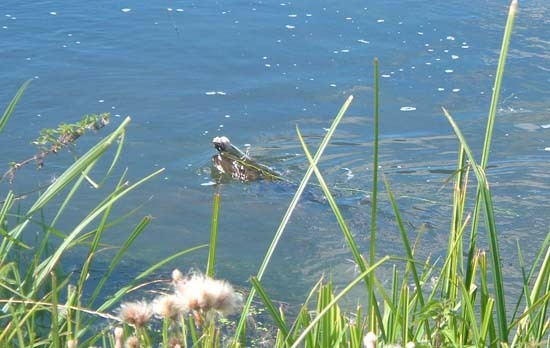 Mysteries are not unusual in fishing. Last week a little puzzle cropped up after I had taken Ben fishing a couple of times. It was easily solved as it happened but for a short while it had me confused. Ben did not go back to school until Thursday. As a result his mam and dad asked if I could look after him for a couple of days. I never mind thse duties with Ben because it always gives me an excuse (as if I needed one) to go fishing. The only problem was that we had to go out in the daytime. The weather was warm and sunny and the tides were not much good for going to the sea. Ben has become a bit disillusioned with carp fishing (like his grandad he's not much of a sit-and-wait person). On the first day we decided to go pike fishing in the river. We started off with a big rubber lure and fished for about an hour. The water was low and clear and there was no sign of fish anywhere. 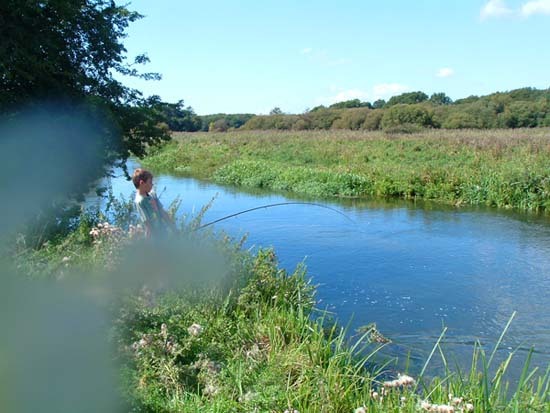 We dredged up lots of weed and got stung by nettles and prickled by thistles but the fishing was slow. We had almost had enough but as we walked back to the car Ben suggested that I changed the lure. I tied on a big, silver spoon and after five minutes fishing, just as I retrieved past a big island of floating cress we saw a pike come out and follow the spoon. The fish grabbed the lure and I handed the rod to Ben - what a tussle! It rushed all over the river and eventually, just as we were wondering how to land it, it buried itself in a mighty weed bed and managed to extract the hook. The pike had been about ten pounds and we were both chuffed with the excitement. 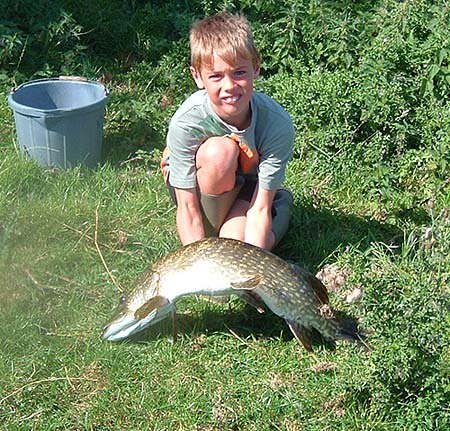 The following day Ben wanted to try for pike again, this time with wobbled baits. We started off by using a grayling on a single circle hook. First cast Ben had a take and a fish of similar size to the one that escaped the day before, seized the bait. Ben played it manfully for a few minutes but eventually it let go (it was never on the hook). We fished a few more spots to no avail then, we returned to the place where the first pike had been lost. This time it was a couple of minutes before it took and it was well hooked in the jaw. Ben played it to a standstill and we managed to take a picture. Then came the mystery. When I downloaded the pictures there was a ghostly, grey irregular shape on the left hand side. I couldn't imagine what it might be. A bit of investigation revealed three or four mackerel scales stuck to the lens of the camera. I flicked them off and the problem was solved but the pictures of Ben's nice pike were not improved.